Inevitably every hunt camp has the usual rifle show and tell and debate to why his or her's rifle and rifle cartridge choice is the best. 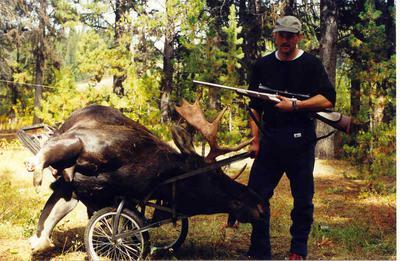 Having experienced this myself and started the debate also... One comes to the realization that just about any rifle with a rifle cartridge 6.5mm (26 cal ) and up with a 130gr bullet and up will harvest just about any moose inside of 200 yards. Shot placement and confidence and being comfortable with the rifle that you are using are more important than the tool that you use. So I say... burn up a few boxes of ammo prior to the hunt and become confident with shooting the rifle you intend to use on your hunt and practice out to 200 yards or so... as most big game hunters harvest within that range.